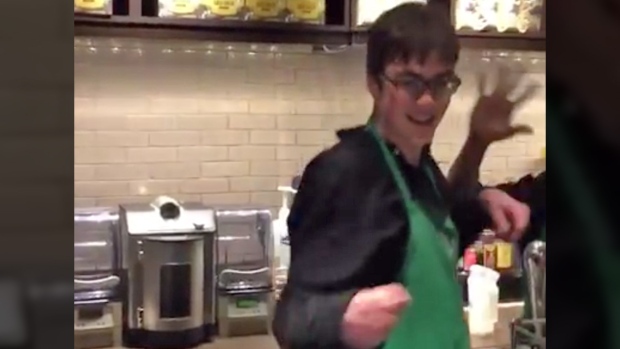 A video of an autistic teen dancing as he works at a Toronto Starbucks has gone viral. The video, posted to YouTube, shows a teenage boy named Sam dancing as he prepares a drink for a customer. As of Tuesday morning, it had been viewed nearly 140,000 times. Fleischmann posted the video shot at a Toronto Starbucks on Friday, along with some information on the teen. Fleischmann wrote that the barista's name is Sam, and that he has autism. "When he was offered a position to work at Starbucks Sam told his parents that for the first time in his life, that his life had real meaning," she wrote.